I am driving a 2015 F-150 Livernois tuned 3.5EB with your lower temperature thermostat and gapped spark plugs. I purchased this entire setup from you about 10k miles ago and have a question. How many miles are my $90 Livernois gapped spark plugs good for? At that price, I would like to run them for as long as I can safely. You might have better luck creating a Truths / Myths thread in the Vendor Showcase section. Then users could see exactly what you're talking about all in one thread rather than having to clarify in users' threads multiple times. I may be interested in a tune. 2015 f150 5.0 scab fx4 3.55 rear. Very unfamiliar with the process. Do you offer any kind of forum member discounts? 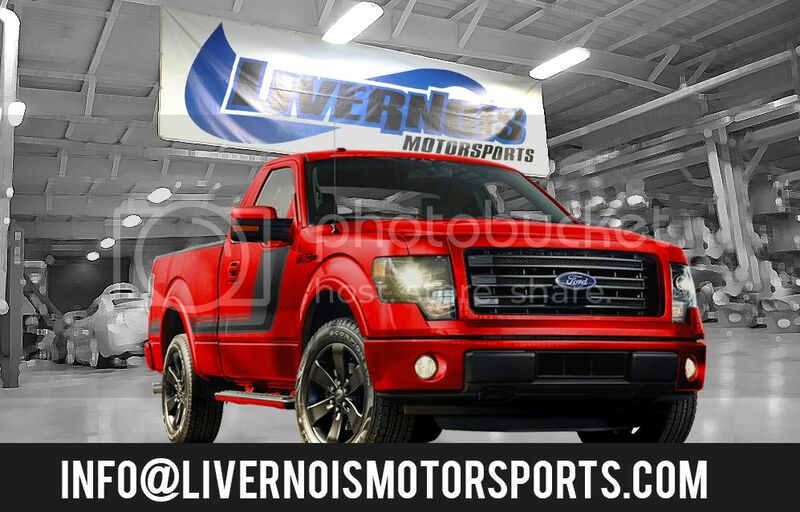 I'm looking at purchasing your 2011+ FORD ECOBOOST F150 LIVERNOIS MOTORSPORTS THUNDERSTORM DOWNPIPES (OFF-ROAD) in the very near future. Hello I purchased your tuner when it first came out for the f150. How can I get the new update? Tuner question for you guys. I'm very interested in a tuner for my 2015 F150 (being delivered this week). I hear great things about Livernois and 5*. If I end up going with a tuner (when available), should I buy the tuner first or my mods? Mods are: leveling kit, 34" tires (275/65r20), exhaust, and CAI. Thx in advance for your time in answering this for me. I have a 2015 F150 ecoboost on order and wondering what you have or will have available in the near future. I have heard nothing but great things about your shop. Also if I plan on using your stuff are there any other upgrades I should plan on. Trying to put together a long term plan and budget. The truck is a daily driver that I want to maximize performance and somewhat keep mpg realistic as well as durability. Thanks in advance for your help!